It is time to make your own solar lamp post light. There are extreme bright and affordable too. Designed to add safety and security to your home, solar lamp post lights are quick and easy to install. All are made of durable plastic, high-quality LEDs and rechargeable batteries. And with no wiring required, they are perfect for outlining remote areas like driveways and pathways. Our solar powered lighting enhances the beauty of your home and surroundings, while increasing safety and security. The unique designs range from traditional to contemporary and with a wide variety of finishes, there is a light for everyone’s personal style. All lights are made from the highest quality materials with reliable, weather-resistant finishes. 6 times brighter solar fixture. Decorative, yet functional, with a unique post design and this light comes in a creative art design with a bird art window pane-like appearance. Some consider as solar bollard light. 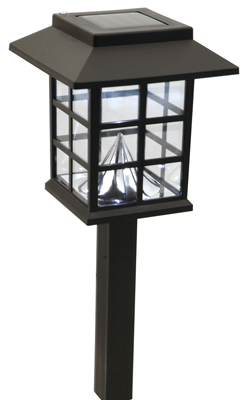 The Solar Woodlawn Post Light is the ideal way to accent your pathway or landscaping areas. Each light is made with durable, weather-resistant diecast aluminum designed that last for years. The amber LED lights included with each unit automatically activates at dusk which means no tangled cords or complicated timers to bother with. And installation is a snap. Just decide where you want to position them and just pust the stake into the ground. No trenching for wires and no obstacles to overcome. This Solar Woodlawn Post Light includes long-life, rechargeable batteries that provide up to 8 to 10 hours of lighting per charge at night. No wiring is required, and using these light save you money on your monthly electricity bill. Illuminate your favorite flowers and plants with Wooden Post Light. Each amber-colored glass lens features a silhouette of a cardinal perched on a branch. The streamlined die-cast aluminum frame has a redwood finish and installs easily thanks to the included ground anchor. Once staked, the light is 21.5 inches above ground height. The amber LED light automatically comes on at dusk and never needs replacing. 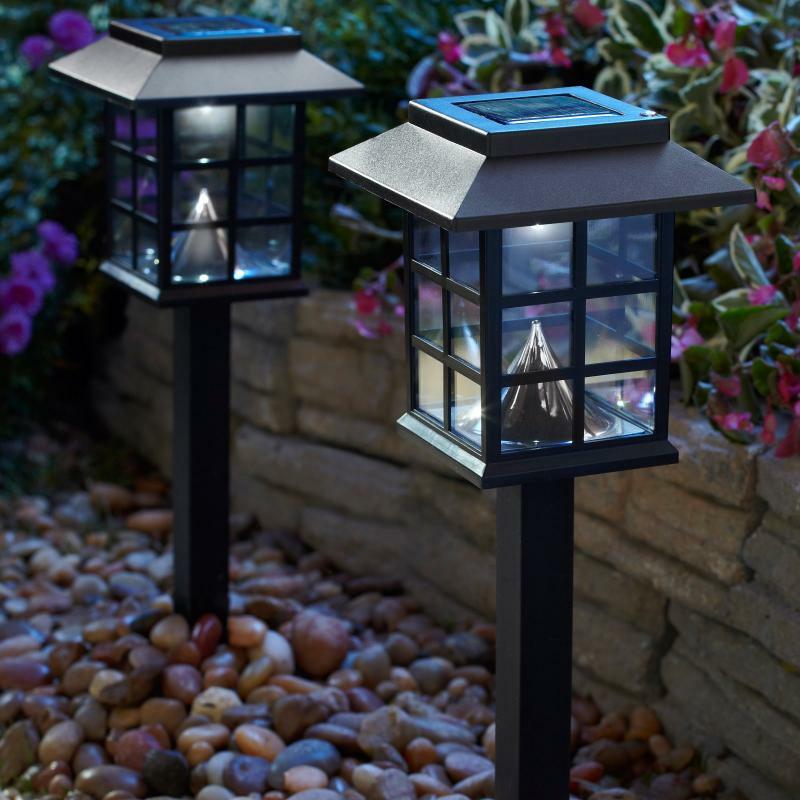 Reflect your sense of style with Mission Style Solar Powered Lamp Post Lights. Made with durable plastic, these path lights have solar panels atop each fixture and run up to eight hours on full solar charge. Modern solar lighting compliments your home perfectly with the clean lines, latticework, and plastic lenses that characterize the Mission style. 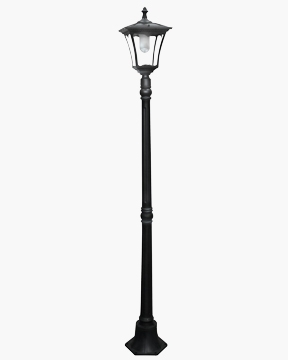 Reminiscent of street lamps outside British pubs or lining the romantic cobblestone streets of Paris, this outdoor solar street light brings all that misty-eve charm home. Classic in its detailed profile, but with a few modern-day advancements, the solar-powered light uses energy from the sun to light up its bright white LEDs at night. 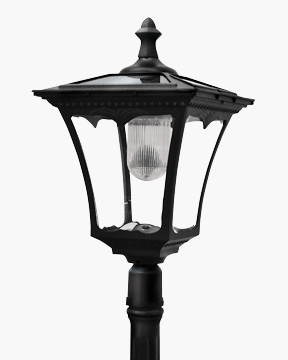 Made of cast aluminum with a clear glass lens, the outdoor light comes fitted with 12 LEDs and four solar panels, which means energy-efficient operation and no wiring required. Even more, the unit lights up automatically at night, so the light will be on, welcoming you home at the end of the day. Placed at the end of a driveway, next to the stairs, near a deck or patio, or in a flower garden, the outdoor light makes a charming accent piece while offering gentle illumination. 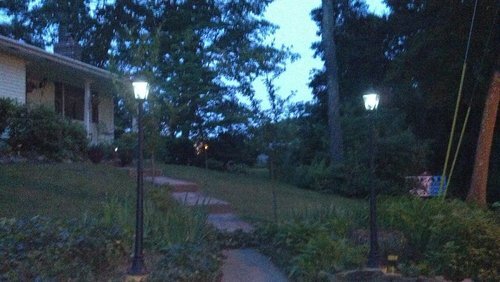 Fully assembled, the streetlight-style outdoor light measures 8-3/4 inches long by 8-3/4 inches wide by 80 inches high and carries a one-year limited warranty. 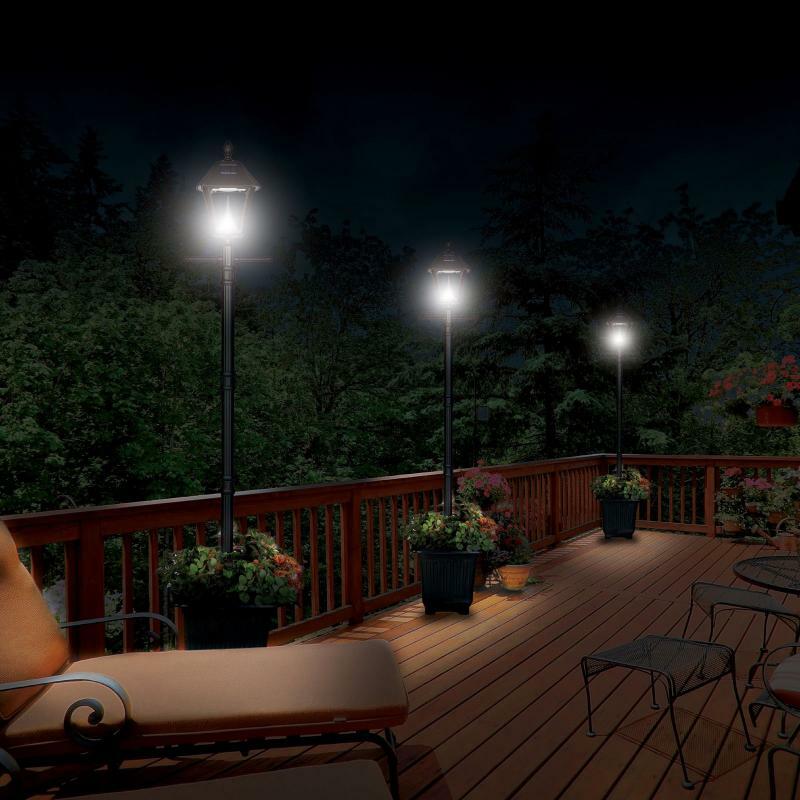 Whether enhancing a garden or patio, creating a guided pathway, or adding ambiance to an evening of entertaining, our solar lighting provides products that allow customers to enjoy their home in a new light. our solar light collection includes architectural-grade outdoor lighting fixtures and collections, walk lights, floodlights, patio and fence lighting, outdoor decor, and more. Solar Light Mart continues to pursue and deliver the latest trends, offering a comprehensive array of innovative, high-quality exterior lighting products for outdoor living spaces. Even more, our company maintains a focus on improved technologies and has a sincere appreciation for sustainable solutions, which means we aim for the highest standard when it comes to creating energy-efficient products for the home and garden. 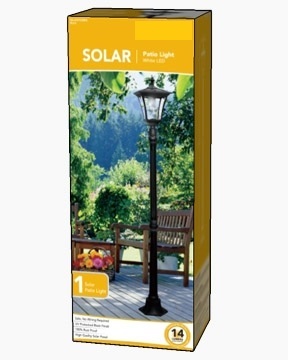 The 77 inch Baytown Planter Solar Lamp Post from Solar Light Mart is truly a unique and stylish way to light up your garden or yard. This 6.5 foot lamp post comes set in a fully functional planter so that you can create a beautiful setting in your yard where ever you desire. With Solar Light Mart patented cone reflector technology and 6 super bright white LEDs this Solar Lamp Post will light the night up where ever you choose to set it up. The Baytown lantern design features beveled glass panes which give it a truly graceful look to make your yard stand out in a class of its own. The lantern is powered by a rechargeable Li-ion battery which stores solar energy collected daily from the monocrystal solar panels located on the lantern. Through the use of solar power this lamp post is completely self sustaining however it is important to make sure that it is setup in an area that receives direct sunlight to ensure optimum performance. The lamp post also contains a manual on/off and hi/lo brightness switch to provide you the option of how bright you want your lamp post to shine. When fully charged the lantern is capable of staying lit for up to 12 hours on low brightness or 10 hours on high. 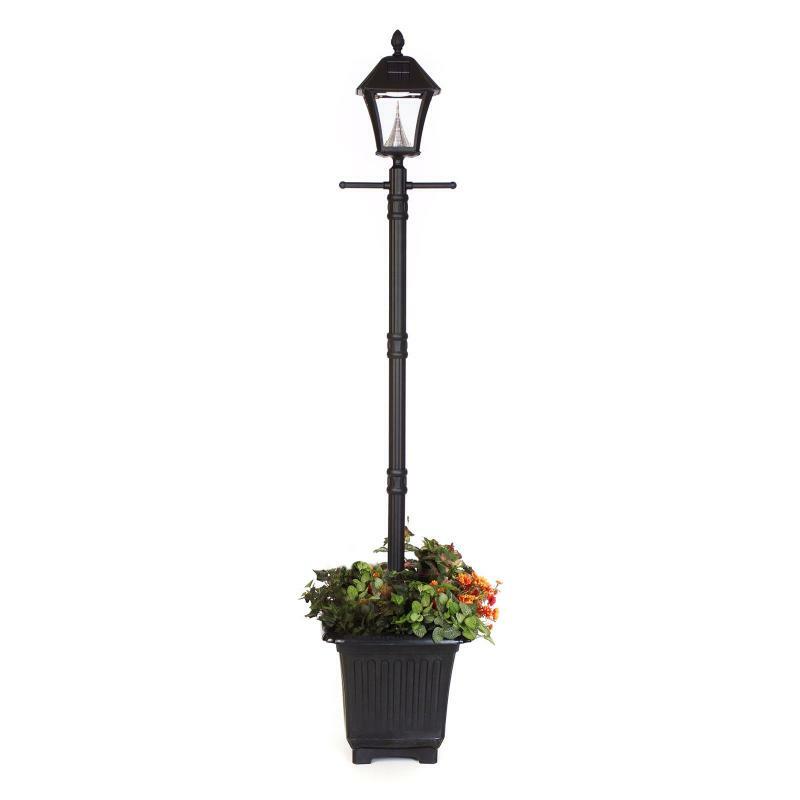 At only 14 lbs the portability of this lamp post lets you move it where ever lighting, flowers or both are needed to accent an area. The planter lamp post is constructed of powder-coated cast-aluminum making it rust and weather resistant meaning it requires no maintenance on the users end. It will turn on automatically as the day turns to night and then turn off automatically come dawn.